The Hilomast Tripod Stand is designed for the free standing of NH-Series masts on hard surfaces. It is constructed of steel and folds into a compact unit for storage/transit. The Hilomast Tripod Stand can also be easily detached from the mast. The mast can be rotated and locked in any position and the feet are adjustable to suit uneven ground. The Hilomast Tripod Stand is intended for use in light winds only and should not be left unattended. Top guys are required for windy conditions. Weight 37lbs. Radius of legs 4.2ft. 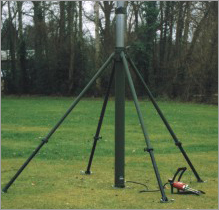 The Hilomast Field Stand is four-legged and is intended for field extension of NK-Series masts. The Hilomast Field Stand is constructed of aluminum alloy and has adjustable legs for irregular ground conditions. The adjustable legs fold into the mast for transit. Ground pegs are supplied for anchoring the feet and base plate. The top bearing and base plate permit the rotation of the mast and a thumbscrew locks it in any desired azimuth direction. Weight is 26lbs. Note for NK-6, NK-9 and NK-11 masts, top guys should be fitted at wind speeds above 25mph. For NK-16 masts, top guys are required at all wind speeds. The Hilomast Top Guy Assembly is intended for use in inclement weather conditions or to give more directional stability to the top of your mast. In some cases, masts will withstand higher wind speeds. The Hilomast Top Guy Assembly is comprised of: a detachable aluminum guy collar; D shackles; and 3 pre-stretched polyester guys 0.2″ dia. fitted with rope grips and nylon adjusters. (Ground stakes are not included.) 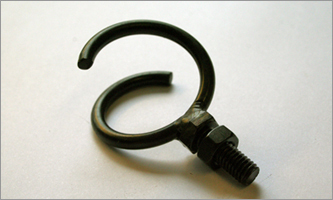 The Hilomast Top Guy Assembly collar is designed to clamp to the upper end of the second from top section of mast. 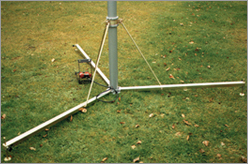 The Hilomast Base Guy Assembly is generally the easiest method of extending a mast on open ground. The Hilomast Base Guy Assembly kit comes complete with: mast fittings; 3 guys; adjusters; base plate; and ground stakes and pegs. The NH-Series and the NK-Series kits have polyester guy ropes and special ‘one way’ adjusters that allow the mast to be set vertically while still supporting it by hand. The NL -Series and NX-Series kits have galvanized wire guy ropes and conventional rigging screws. The Hilomast Cable Guides are made of stainless steel and screw into tapped holes especially provided in each mast collar. The Hilomast Cable Guide will permit feeder cables of up to 0.47″ diameter to be attached to the mast without disconnecting the end terminations. Eye 1″ diameter. Hilomast Cable Guides and supports are sold individually.